Stiff bristles for cleaning feed pans, buckets, or water troughs. Soft finishing brush by Oster Professional Products. Densely packed soft natural bristles with a control touch handle to reduce hand fatigue. A bit spendy for a brush but the quality is unsurpassed. 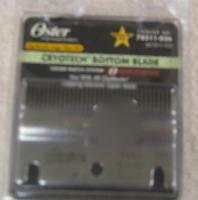 Top blade for oster clipmaster (beef) head. Bottom blade for oster clipmaster (beef) head. Imported, this is an upper and lower blade set which fits an oster clipmaster (beef) head. 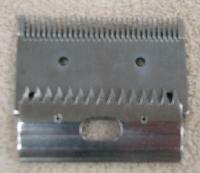 We have not tested these blades yet so quantities are limited until we receive feedback but the price is right. 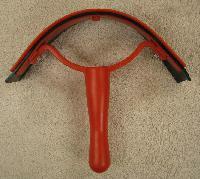 Rubber Curry Comb allows you to curry horses or cattle without fear of injury or pain. Safer than metal in less experienced hands. Grooming apron designed to keep equipment and supplies close at hand while grooming horses or livestock. Plastic sweat scraper with rubber. Available in Red, Green, & Blue most of the time. Oster® Sweat Scraper Features: Soft, comfort grip for more comfortable fit in your hand and less fatigue. Contoured, hollow shape comfortably hugs the body and pulls more moisture and dirt with each swipe to save time. Soft contact edge is more comfortable for the horse and more effective for sweeping away water and dirt. Light and easy to use for ratting tail hair. Aluminum construction. Tooth area: 3-3/4". Overall length: 8".